The sleek functional lines of these benches complement any studio. 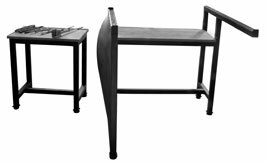 Tested by many professional glass blowers, these benches offer ergonomic support that facilitates gaffer operations. 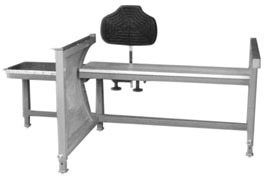 The unique bow on the active end of the bench lessens strain when leaning out, while the lower cross bar provides a positive foot hold. There is a tool hanging bar behind the seat and a jack blade support on the tool tray. The Deluxe Model has a back rest and 6” of seat height adjustability. Both benches are available with detachable tool trays and optional stainless tops. Pipe turners save time, keeping color and parts hot, ready, waiting, and on center! Powered by a reliable, solid state, industrial motor, with adjustable speed control. A basic model turns three pipes. This machine works hard for you! Available in other sizes and configurations and also with a bracket for the torch minder. 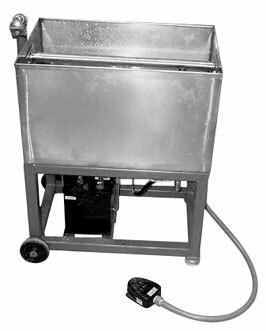 All pipe coolers are equipped with stainless steel bearings and are available with a fountain or trough for cooling the pipe. They can be set up so that the water turns on automatically or is controlled by a foot switch. 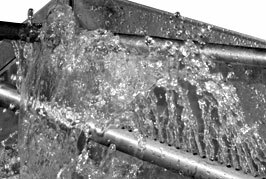 Water is re-circulated from a large, easily emptied stainless steel reservoir. The standard model uses a re-chargeable 12 volt battery to operate the pump. Water flow is controlled by stepping on the foot switch. These heat shields have sheet metal on the hot side and wood on the cool side with an air space between so you stay cool. There is a handle for moving it, and it rolls easily on casters. A sight glass is available. 65” tall x 29” wide. Sight glass is available in any size; call for pricing. This versatile Murini chopper will cut from 2” to the smallest diameter cane with no problem. It will cut square and shaped cane just as easily. It sounds hard to believe, but it’s true! The adjustable anvils and combination hand and kick operation make it possible. Stainless steel bearings for a lifetime of use. Available in any width and height; call for pricing. Solid steel construction for thousands of heats. .5" thickness. Available w/ milled cane grooves. Makes it easy for you to set the hot pastorelli plate down with the carrier and turn it 180° around before picking it up again. Our heavy duty press cast iron cup is welded to a T-style handle 5' in overall length. This 11 gauge 8" hemisphere on a 46" long handle makes it easy to get the batch from the container to the furnace quickly without spilling. Great for pushing batch or moving those bubbles. A must for every glass shop. Solid stainless steel construction, 5' overall length. Plastic can on wheels with lid. Holds 150 lbs. of batch. Includes a metal ring to protect the inside of the batch can. Great for moving batch to the furnace. 3/4" steel plate Blanchard ground on one side. MV1224—12"x 24"x 28" tall—$ 890.00. We can supply any size marver. (1.5" diameter by 1.25" long) of pure beeswax—nothing added.